The Full Colour high quality A4 Flyer distributed to residential households in your local community. Powerful yet much less cost than delivering your own leaflet. Dor-Dropz is an A4 single sheet Printed on high quality 150gsm Triple coated gloss art paper. 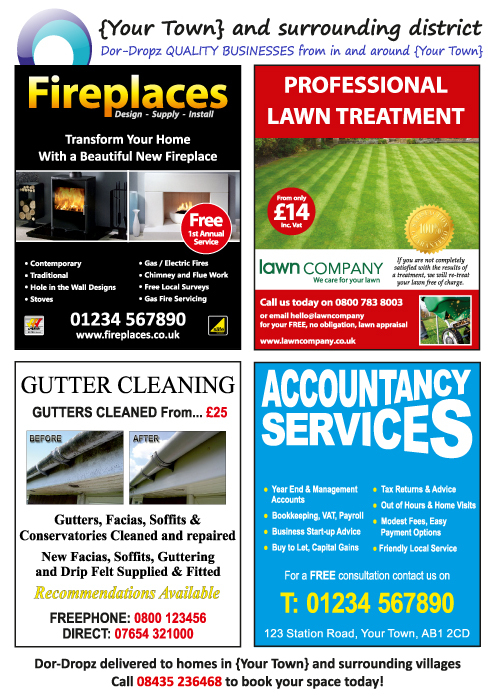 The flyer is designed with 4 eye-catching adverts on each side. When the large A4 format lands on the doormat the householder can’t miss it and the adverts really stand out. Remember both sides are the front! Only one business type per publication may advertise. The Dor-Dropz is distributed in the local community by your Local DOR-2-DOR franchisee. Standard adverts are 95mm x 120mm so plenty space for a good looking advert or take 2 spaces for even more impact. Dor-Dropz is professionally delivered by Dor-2-Dor who have been established for over 25 years and only use experienced, well trained and monitored adult Post People™. DOR-2-DOR are full members of the Direct Marketing Association and Licensed by Ofcom the governments communication regulator. Our specialist design team who have years of experience can take your basic copy and turn it into a super attention grabbing advert and this is all included in the price. You can book your advert to run for 3 or 12 months or if you prefer you can run a single insertion at very affordable rates. The affordable price includes print, distribution and design so with a single payment your message is printed and delivered to 000’s of local households. "Since using DOR-2-DOR our business has improved tremendously, we know we can rely on DOR-2-DOR who have proved completely efficient and a pleasure to do business with." "Brand building and creating the right product set, incorporating meeting rooms, telephone answering and virtual offices has been part of our recipe for success. DOR-2-DOR was very professional in their approach, provided cost effective service and gave us excellent feedback. When I use them I am confident that our exact requirements will be met." "I would recommend DOR-DOR anytime because they delivered on their promises and reliably met our deadlines. The response and the whole experience was very good from our perspective." "I can confidently recommend Dor-2-Dor as a solid and reliable supplier, and experts in their field. Thank you Hazel and your team for all of your help, advice and expertise during the first half of our campaign. We look forward to working with you again." "The best marketing we have ever done. I would recommend anyone to use DOR-2-DOR. I would say they are friendly and reliable with honest staff providing a marketing service that is good value for money." "This is by far the best form of advertising for us. DOR-2-DOR'S customer service is great, They keep us informed of progress and regularly comes in to see us, we don't need to chase him. We know the leaflets will be delivered." "I have recommended DOR-2-DOR to other Dominos franchise owners and I do so because the service has been the most responsive and efficient that we have used." © Dor-Dropz™ All Rights Reserved.